www.mahatransco.in is the official website for Maharashtra State Electricity Transmission Company limited. Every year mahatransco.in release advertisement notification for recruitment for smart boys and girls. The selection process is done through written test and interview. 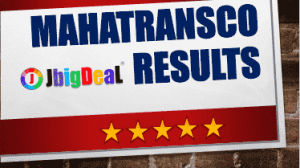 As per the latest news by www.mahatransco.in Result 2018, the Assistant Engineer (AE) Trans and Civil Posts Exam 2018 result is published online.